Our CrossFit program involves a work out that we do at the start and the end of the program to determine if our dietary changes over the next six week result in a change in our performance (see below for baseline workout). I had a hard night with only 3 hours of solid sleep. I was a bit woozy during the workout. I have never eaten anything before a work out (stomaching food at 5 am is quite difficult for me) but I am trying to eat a little something (banana or a few almonds). I did learn that it is important to have a small something that is 1:1 carb and protein as soon as possible after the workout. I am still figuring out the carb – my usual go to carbs are oats or toast, which are off limits for now – so I just had a hard boiled egg. Yes an egg. So if we are to get technical and label my diet, as it seems there is a label for everything these days, I am an ovo-lacto vegetarian. Some question my egg consumption if I don’t eat meat. Isn’t an egg a form of flesh? Maybe, but for the most part, eggs sold in the grocery store in this country are unfertilized; fertilized eggs must be specially sought out (though I think that is relatively easy in a farmer’s market or a place like Whole Foods). This may be TMI for some, but I am a scientist, so this is just how my mind works. Every month I release an egg. The overwhelming majority of of these eggs are unfertilized. Though so fanatics might disagree, I do not consider these eggs “beings” I have killed because I did not fertilize them (same way hundred and thousands of life containing sperm die without meeting an egg). Do I have an issue with eating meat? No, not for the most part . I am vegetarian because it was best for my body, nothing more – no ethical or spiritual beliefs associated with it when I began. But a funny thing happened in my 17 years or so of vegetarianism, my thoughts on eating animals have evolved. I have found that if I can’t kill it, I can’t eat it. And yes, killing a plant is killing life. I don’t like being removed from the process of making the food I eat. Just as it is important to read labels to understand what ingredients are in processed and packaged goods, it is important to understand the process. But really in the end, I eat what I eat because that is what is right for my body. We are all individuals with our own constitutions, microbial floras and enzymes. I don’t ask you to follow my diet because it may not be right for you, as yours may not be right for me. So back to the point. Due to the limited sources of vegetarian protein in the Whole30 guidelines, my diet will incorporate a lot of eggs. And because of the limited sources of protein and food in general, I need to think ahead, menu plan and bring my food with me so I reach for healthy snacks and meals that contain whole foods and proteins. If I am stuck at work without food, I may be limited to eating like a rabbit or not being compliant to the program. If you have a job like mine, bad food is EVERYWHERE. I walk in and am greeted by a bowl full of chocolate. I see that bowl every time I go to the rest room. We have jars and jars of chocolate scattered throughout the office. The kitchen is full of falsely healthy cereals. There is always left over pizza, sandwiches, chips, cookies, cake from a meeting or some event. People bring back sweets and carbs from trips. I am so thankful I menu planned carefully this week because this week is “employee appreciation week” in which everyday of the week we will be treated to some sugary carby snack – doughnuts, hoagies, popcorn with toppings, a dessert bar and something else I don’t want to know about. I have basically avoided the common spaces in my office so I am not tempted. I feel like a prisoner at my desk – but at least I am not suffering the 3 PM sugar crash. After my egg this morning, I had a cup of bulletproof coffee I made at home. I don’t know if I buy into the hype or science behind it, but it does taste good and it did keep me satiated and stable. 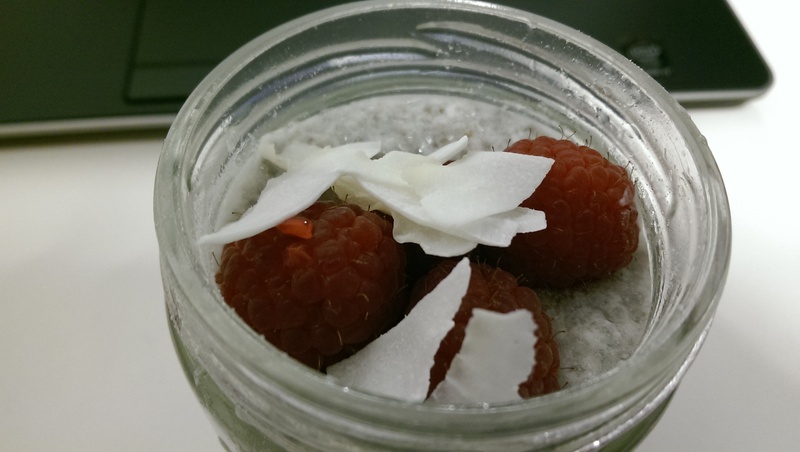 Mid way through the morning I had chia seeds I soaked overnight in full fat coconut milk and topped with raspberries and coconut flakes. Prior to this program, I only used canned coconut milk to make coconut based curries. 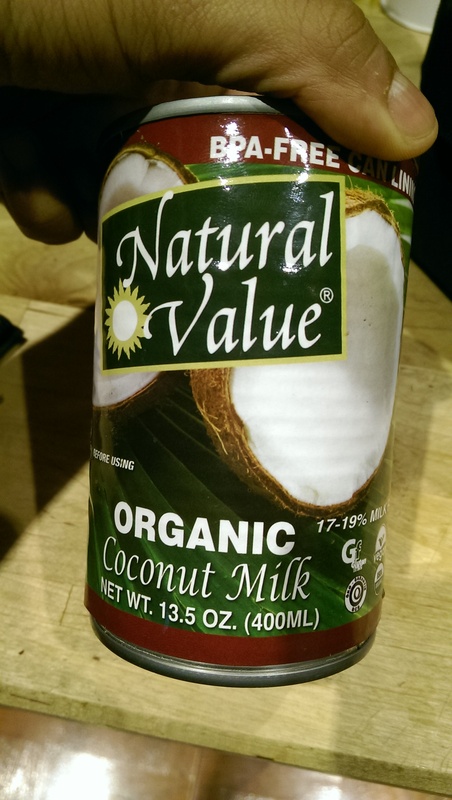 But the guidelines recommended full fat canned coconut milk without any extra added chemicals or sweeteners. I used to read labels carefully, but my shopping trip to Erewhon yesterday taught me that I have been lazy about caring what those labels actually said. In recent years I have only been scanning to make sure no meat or fish are included but have been glossing over the chemical fun factor. There is a lot of extra garbage in packaged foods, even a can of coconut milk (which is why we should only eat food grown locally, but that is another challenge). It took me nearly 20 minutes of inspecting cans of coconut milk to find one that did not have any guar gum added. An added bonus is it is packed in a BPA-free can! As a mother, I have become hyper-BPA-conscious. Please read labels as closely as you can and question everything you read! 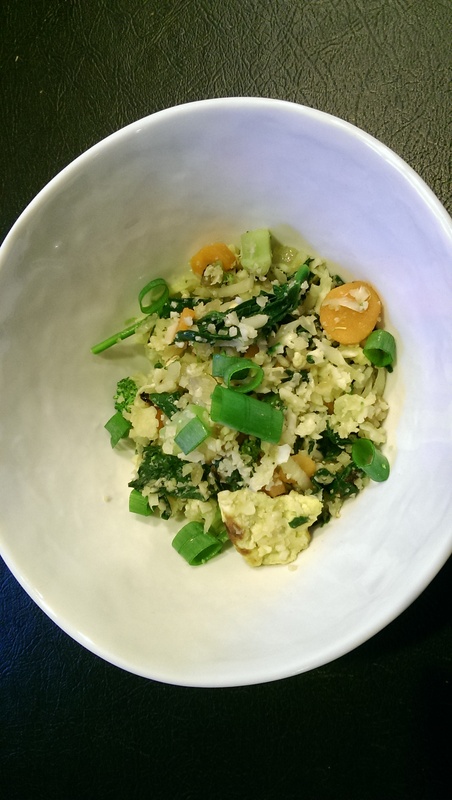 For lunch I made a stir-fired cauliflower “rice” with spinach, onions, carrot, scallion and egg. The cauliflower is shredded in a food processor to resemble rice and cooked with the veggies and egg. Instead of using soy sauce or anything like that, I used liquid aminos. In the past I used Bragg’s liquid aminos, but soy a no no in Whole30. Luckily I found oraganic coconut aminos at Erewhon. Coconut aminos are made from the sap of the coconut palm. Like, soy, coconut sap is a complete protein because it contains all the essential amino acids, but it has even more than that. coconut aminos provide 17 amino acids. However, coconut aminos are less salty than Braggs, so I added a bunch of himalayan pink salt and ate it with SeaSnax Roasted Olive Seaweed – it was delicious. My husband, not in the program added braggs and sriracha to his. As my day became more and more stressful, I really wanted a piece of chocolate and i am surrounded by cheap milk chocolate, but luckily I packed a bunch of veg in my bag and kept munching on radishes and celery. I also had some carbonated water. Surprisingly, it kept me away from the chocolate. I wish I could tell you I had time to eat dinner. I actually made some awesome food yesterday for today’s dinner. But thanks to work and me wanting to do things for myself in life, eating dinner was not in the cards for me – don’t ask, I don’t really want to talk about it. I really really wanted that glass of wine. Luckily I prepared for that too! 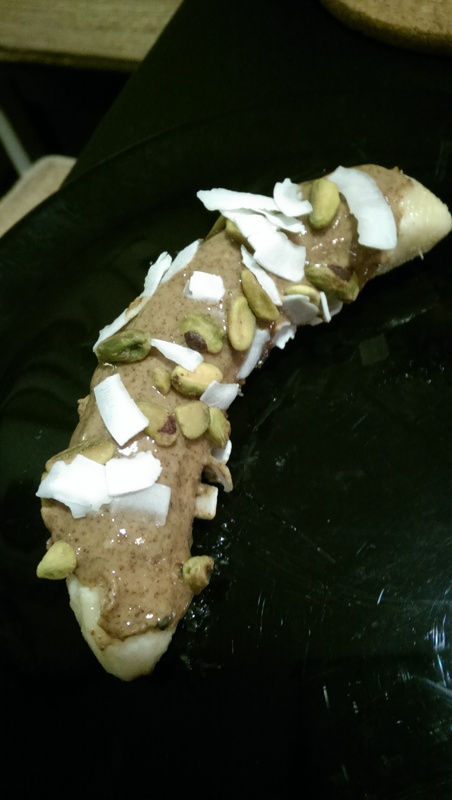 Last night, I froze a whole banana, topped with almond butter, coconut flakes and pistachio nut meat. Almond butter is another sneaky one – be sure to read labels, they can be loaded with sugar (or make your own! it’s really easy). After it was frozen solid, I cut it into slices – what a heavenly treat. This was a decent amount of food for a person with high cortisol levels and a stress induced nauseated stomach. I highly recommend adding another meal or two for a normal day. So, I am thankful I cooked enough for two as well as a half sized pint for two days because tonight I will be working till the wee hours. I used my down time to blog, because if I don’t do something for myself, I will go mad. Do one small thing for yourself every day. It makes the day worthwhile. That and an evening dance party with a little one grinning widely with a face covered in blueberries. Empty a can of full fat coconut milk into a blender and blend with equal part water until smooth. Add 4 tbs chia seed and soak over night in the fridge (chia will expand so leave enough space in the container). Top with raspberry and coconut. If you need additional sweetness, mix in a blended date, though I think the berries are enough. Chop the cauliflower and run through a food processor with the appropriate blade to grate the cauliflower (or use a hand grater) so it looks like rice (but don’t over do it) and set aside. Heat 1 Tbs ghee in a wok (or pan) and add onion – cook for about 3 min until brown and set aside in a bowl. Add a tsp of liquid aminos to the eggs and mix. Add a tsp of sesame oil to the wok, add egg and scramble. Then mix with onions and set aside. Add 1 Tbs ghee, carrots and spinach to wok and cook for 3-5 min until tender, add grated cauliflower and 1/4 cup liquid aminos and some salt, stir fry for about 3 min. Add in egg and onion. salt and pepper to taste (if eating with salted seaweed, keep salt content in mind). Garnish with sprouts and scallion.